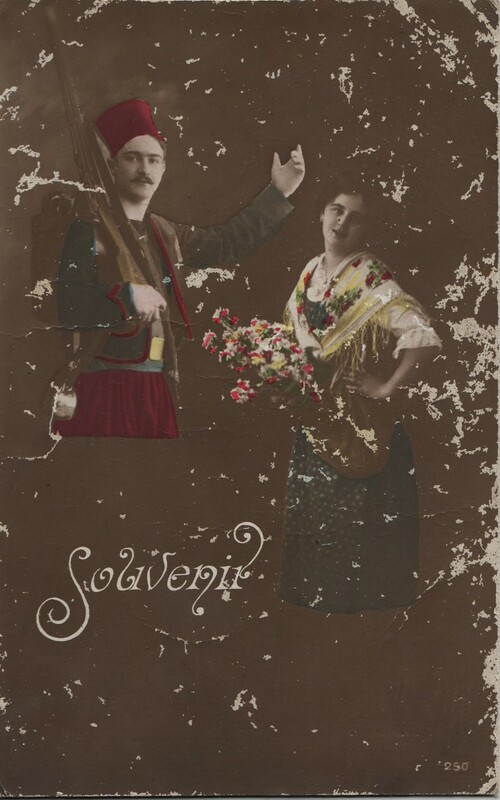 I have just received your good card of the 25th with pleasure. If things continue like that, I will still be happy, in spite of the misery because it is always a great relief to have news every day. I am very happy that you have news from me but I would like to know where you’re going and when you will arrive to this again damned destination. Hopefully you won’t catch anything. All these thoughts. I continue to hoe the peas but it is very difficult with all these clumps of soil. I can’t feel my arms anymore. You have to be dedicated. I leave you my dear Camille by kissing you very tightly. Your wife all yours. 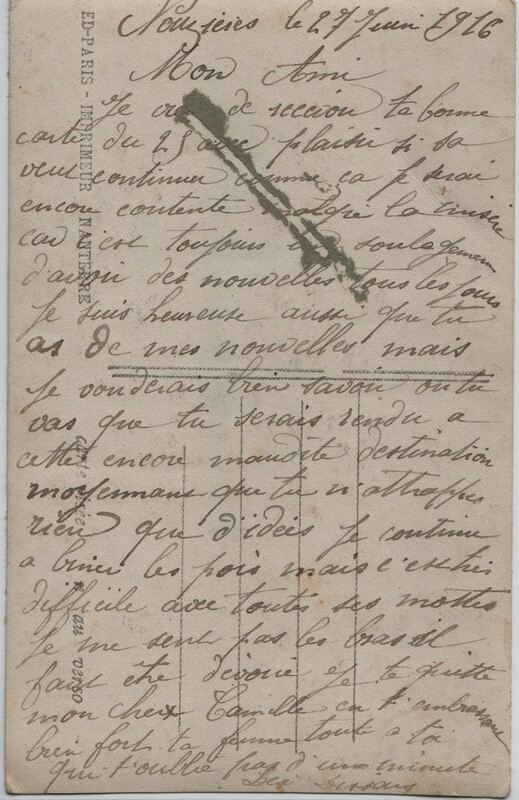 The post seems very efficient: it only took 2 days for Camille’s postcard to arrive. 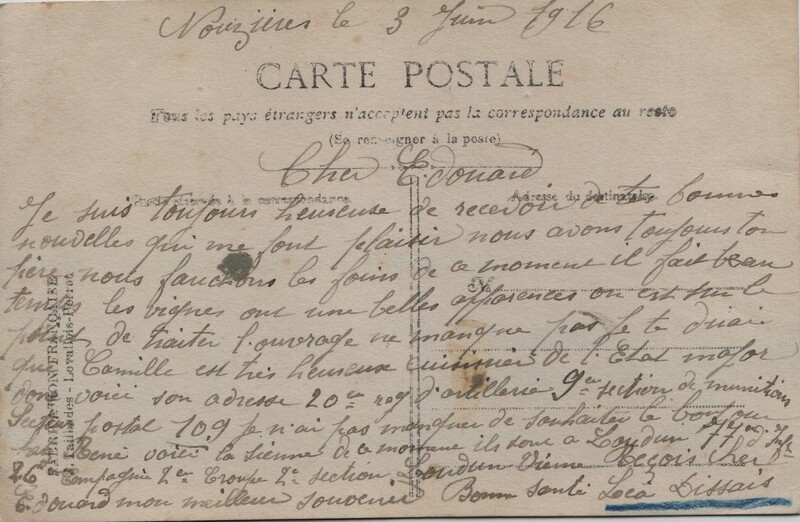 Postal services were crucial in enabling communication between the front and home. 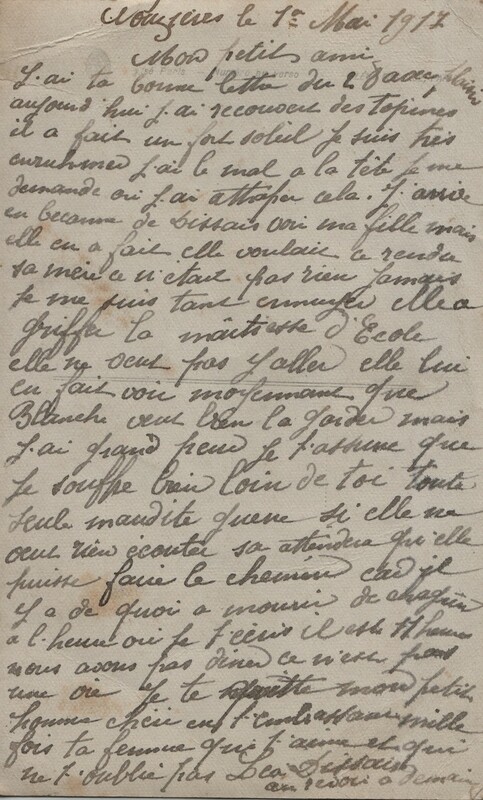 By 27 June 1916 Camille is working as a cook for the Etat Major. It maybe that the section he was attached to is moving around. Soldiers are probably not allowed to mention their destinations or locations. Legend: I put into my letter my heart and my kisses full of tenderness. Little post, for his happiness, bring them quick to his address. 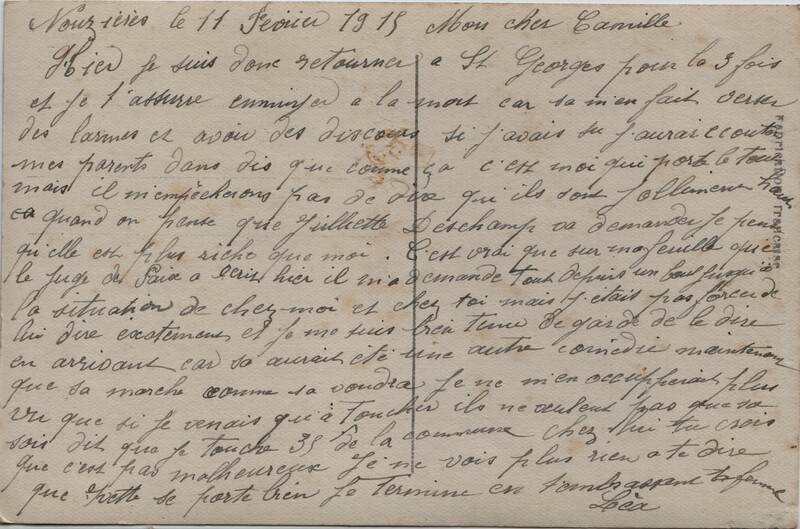 Notes: Léa, like many other French wives, sends her husband food parcels, here a tourtière or meat pie. This would have been a lovely treat for him. 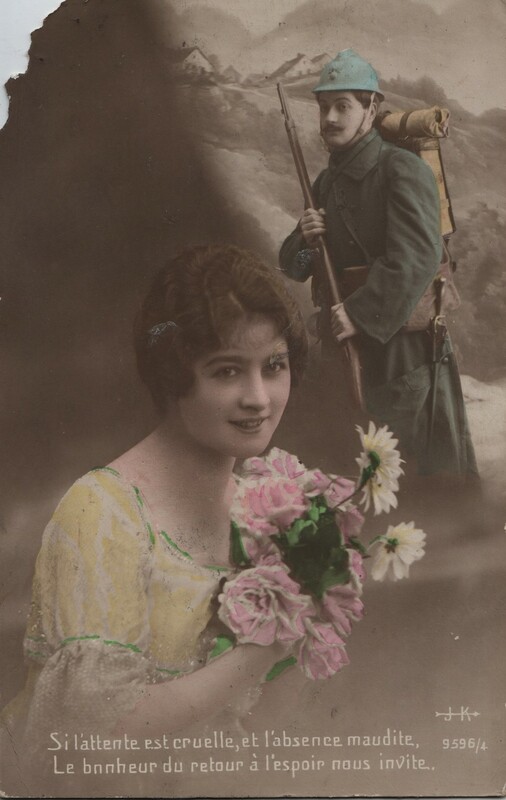 The message on this postcard is quite dark and shows how the war is taking its toll on the women left behind: they feel lonely and burdened by the need to work to provide for themselves, their children and their husbands who are fighting on the frontline. The war started on July 28 1914. 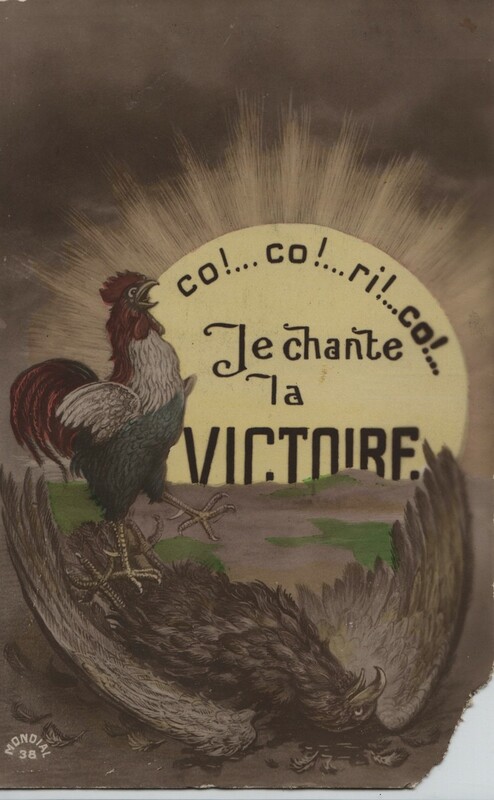 By March 1916 the French population was beginning to realise that the war was going to last a long time. The last war against Germany was relatively short-lived (19 July 1870- 29 January 1871). This war was different and came as a shock. There was no end in sight. The length of the war contributes to enduring and increasing hardship amongst both the military and the civilian population. The price paid in both mental and physical health was becoming intolerable to many who, like Léa, have to fight very dark thoughts. I don’t have any news from you. Hope you haven’t caught anything. The heat continues. Always attending to the peas. They look good. I can’t think of anything else apart from the fact that I am not so strong. We can’t eat the bread; it’s so bad. Receive a thousand good little pecks from your wife, all yours and who loves you. 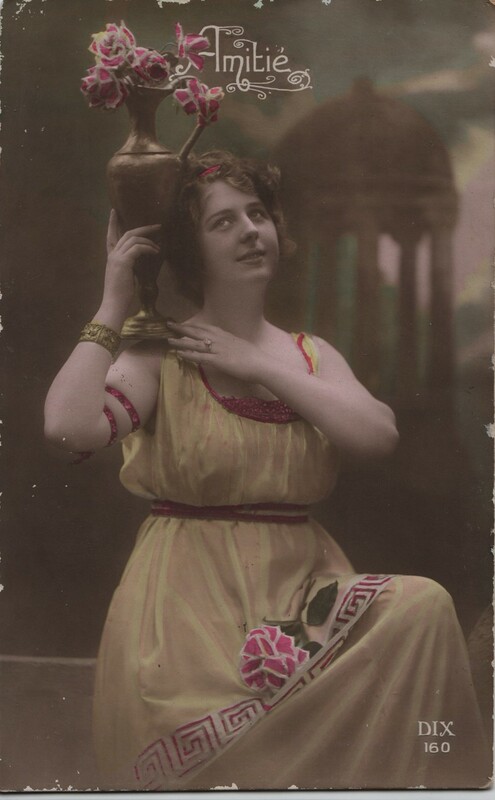 Translator's note: Bread was an essential part of French diet at the beginning of the twentieth century. 328kg were consumed per person each year (as opposed to 58kg today). From 1917 bread was rationed to 100gr per day and coupons were necessary to buy it (tickets de pain). Léa complains that the bread is inedible. During the war the national production of wheat declines (shortage of labour and destruction of plants) and imports are difficult (wheat was previously imported from Germany). The French are forced to use products other than wheat to bulk up the supply of flour. All sorts of cereals, grains and food stock are used and mixed with whatever flour is available. 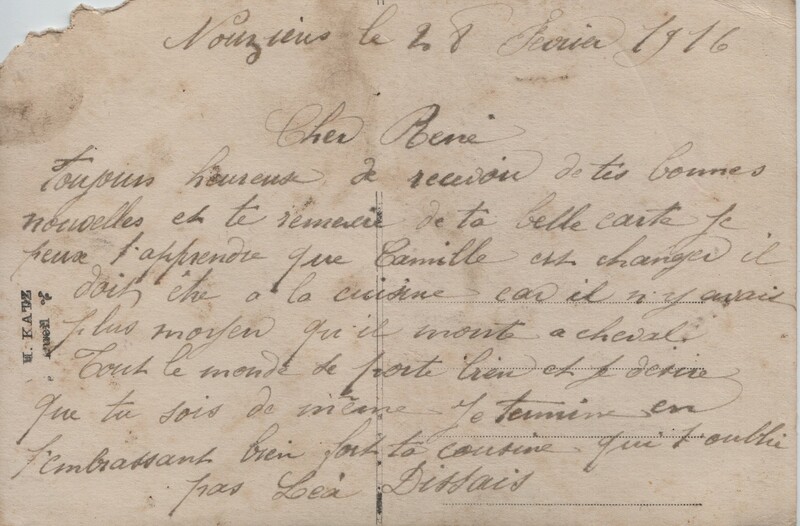 This might have included chestnut powder, peas, corn, rye, ec…The mix made the bread look very black hence the French name given to the bread produced during this period: pain noir. I am always happy to receive your good news that always please us. We still have your father. We are cutting the hay at the moment. It is good weather all the vines look good. We are about to apply treatment (spray them). Work is not lacking. 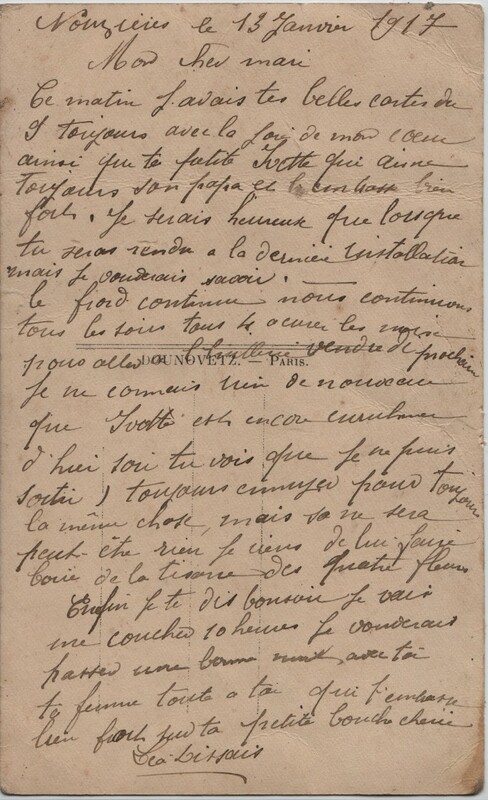 I will tell you that Camille is a very happy cook for the Etat Major and here is his address 20 Régiment d’artillerie 9ième section de munitions (ammunition section) secteur postal 109 (postal sector 109). I did pass on your greetings to René’s family. Here is his [address] at the moment they are in Loudun, 77ième Infan (Infantry) 26ième compagnie 2ième troupe 2ième section, Loudun Vienne. Receive dear Edouard my best wishes, good health. I answer your good card of the 16th, including your pretty face that I love so much- and to always be separated from it...surely you are the best..and first of all my dear husband. I only have to wait until tomorrow to know whether my parcel has been lost. This really annoys me but what can you do? 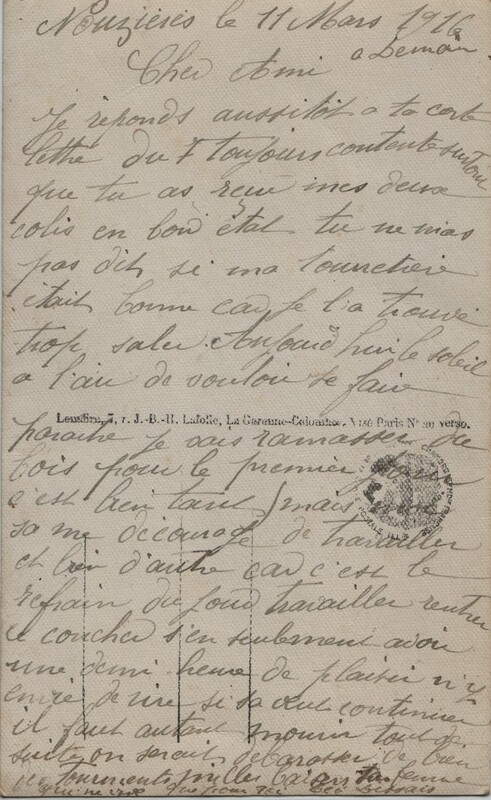 I write in a hurry as today I have two Parisians and I do not have spare time. Tonight I am going to sell our asparagus and ask Brotier if he has failed to send my second parcel- excuse me my darling. Receive all my good wishes […can’t read the end on web]. 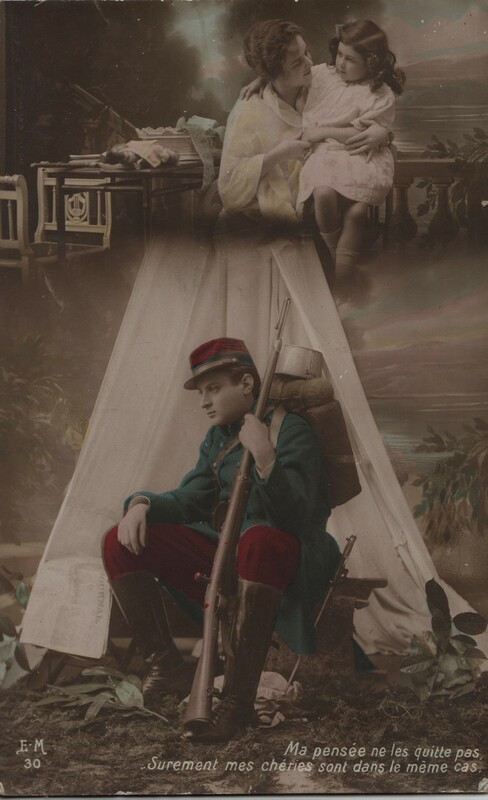 Note: Some Parisian soldiers sometimes took refuge in the countryside during their military leaves as Paris was not a safe place during the war. It is possible that Lea, acted as hostess for paying guests [?]. 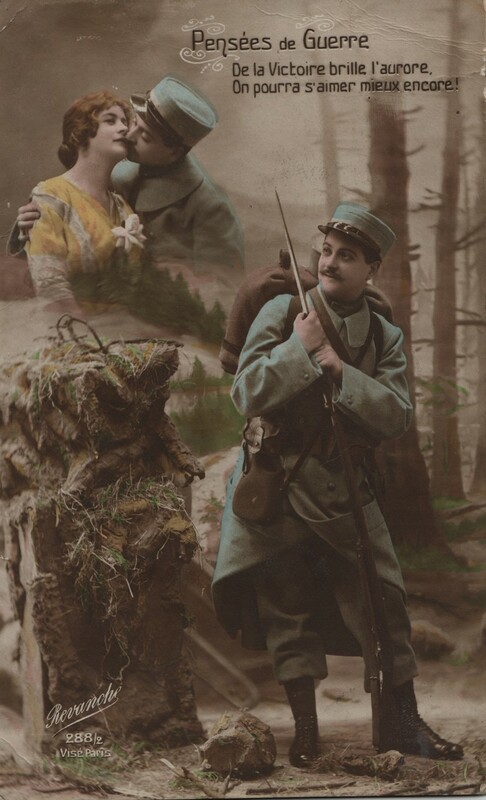 Camille sent a photo-postcard of himself to his wife as many soldiers did. I have received your good letter of the 28th with pleasure. Today I have covered up the topines. It is very sunny. I have a very bad cold; my head hurts - I wonder where I caught that. I have just come back from Dissais by bike to see my daughter - but she has been a handful. She wanted her mother- she made a terrible fuss; I got so annoyed. She scratched the teacher with her nails. She does not want to go to school - she made the teacher’s life hell - Blanche is alright to look after her but I am really worried; I tell you I am suffering so far away from you, all alone - damned war. If she doesn’t want to listen to anything [the daughter] she’ll have to wait until she can come back by herself- as there is enough to die of sorrow. As I am writing to you it’s 11 in the evening; we haven’t had our dinner. It’s no life. I leave you, my little darling man, by kissing you a thousand times. Your wife who loves you and does not forget you. Until tomorrow. Note: Topines- this refers to either potatoes or Jerusalem artichokes (topinambours - very popular during this period). 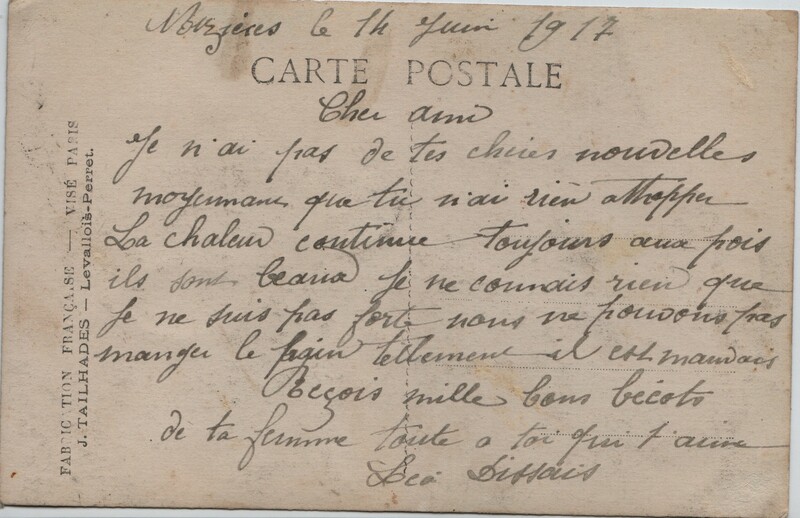 “Ella a griffer la maîtresse d’école”: Léa’s main concern in this card is to inform her husband of the bad behaviour of their daughter who has scratched her female teacher. Male teachers, like other men, were mobilized and replaced by women. There is a feminization of the profession that changes the education system. At home the authority of the father is also replaced by that of women. The absence of the father is changing the family dynamics even though many try to continue to assert their authority in their writings by exhorting their children to behave and be good. 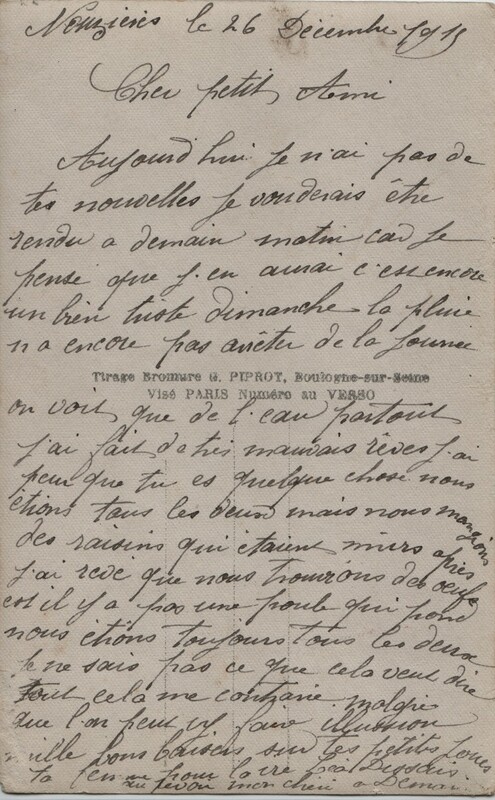 This “distance parenting” is very widely spread and has been seen by French social historians as part of the war culture and sometimes as very damaging as fathers often entrusted their children with responsibilities that were far beyond their age (for example being good all the time and looking after their mother). 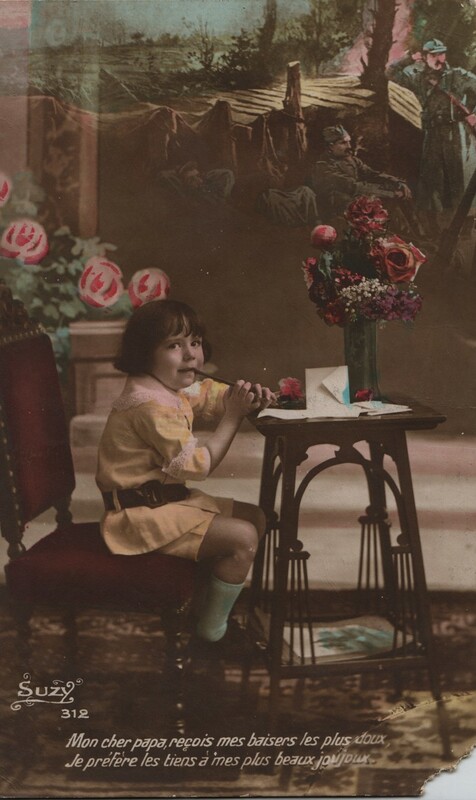 Historians often speak of the “lost childhoods” of the war children. 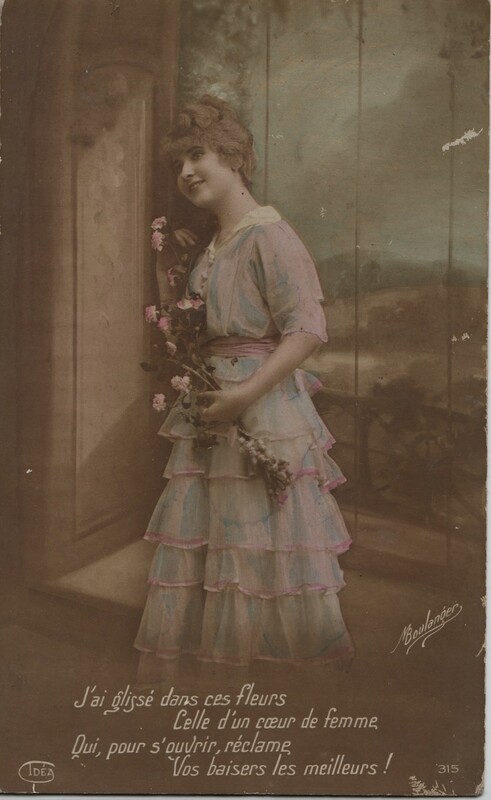 See Manon Pignot, “Les enfants” in Encyclopedie de la Grande Guerre 1914-18. This morning I had your beautiful cards of the 9th- always with the same joy in my heart and same with the little Yvette who always loves her papa and kisses him very warmly. I will only be happy when you have reached the last installation but I would like to know. The cold continues. We continue every evening, the 4 of us, to scrape the walnuts to go to the oil factory to sell very soon. Can’t think of anything new apart from the fact that Yvette has a cold again from yesterday evening- you see I can’t go out. Always bothered for always the same thing; but maybe it will be nothing. I have just made her drink some four flowers herb tea. Finally I say good evening to you; I am going to bed- 10 o’clock. I would like to spend a good night with you. Your wife all yours who kisses on your little darling mouth. 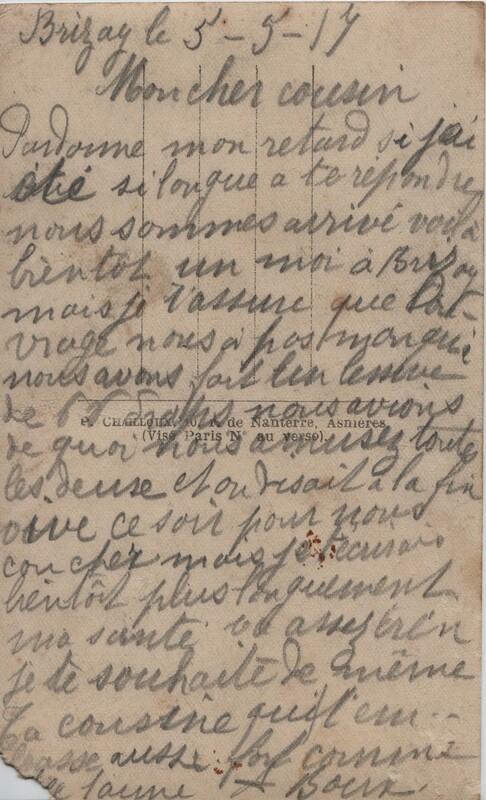 Ce matin j’avais tes belles cartes du 9 toujours avec la joie de mon coeur ainsi que ta petite Yvette qui aime toujours son papa et l’embrasse bien fort. Je serais heureuse que lorsque tu seras rendu à la dernière installation mais je vouderais savoir. Le froid continue nous continuons tous les soirs tous 4 a curer les noix pour aller à l’huillerie vendre de prochain. Je ne connais rien de nouveau que Yvette est encore enruhmer d’hier soir tu vois que je ne puis sortir toujours ennuyer pour toujours la même chose, mais sa ne sera peut-être rien je viens de lui faire boire de la tisane des quatre fleurs. Note: Léa went to Saint Georges for a financial assessment to see whether she could be eligible to receive the allocation militaire available to needy families of mobilized soldiers. Some towns also provided free potatoes and coal to these poor families. Léa obviously finds French bureaucracy very boring and annoying, and French bureaucrats very pretentious. She is very savvy and knows how to answer their questions and work the system. Because the allocation militaire was means tested (which was more or less accurate) this would probably have created tensions and jealousies between neighbours- some receiving it and some not. On the outcome of these visits to Saint Georges see card 20 in group 5. Today I have no news from you. I would like it to be tomorrow morning as I think that I will get some then. It is a very sad Sunday- the rain has not stopped the whole day- all you see everywhere is water. Bye my darling till tomorrow. 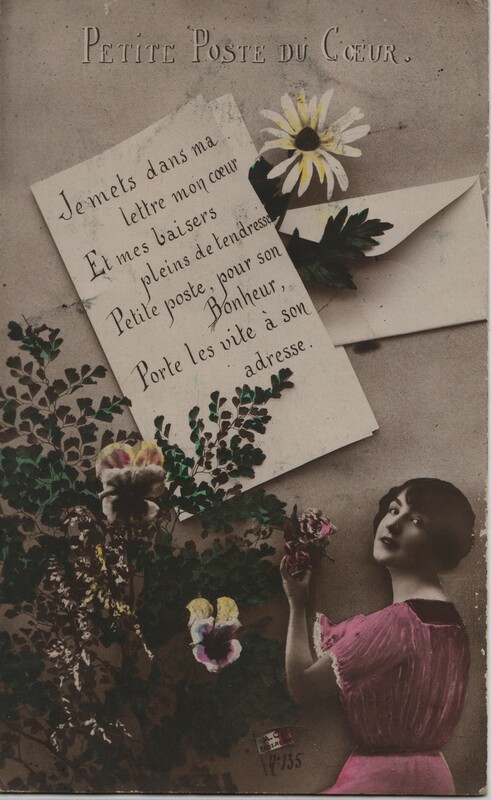 Note: This postcard was written the day after the second Christmas spent way from each other. Léa’s dream reflects her despair and anxieties as well as the rural setting where she lives. 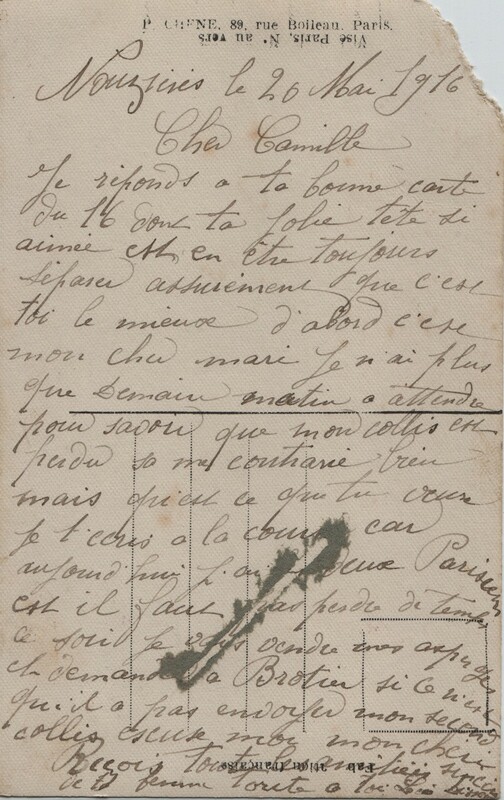 This is a great example of the sharing of emotions through correspondence and must have been received by Camille as a poignant reminder of all he had left behind (the loved ones, the vines and the chickens).